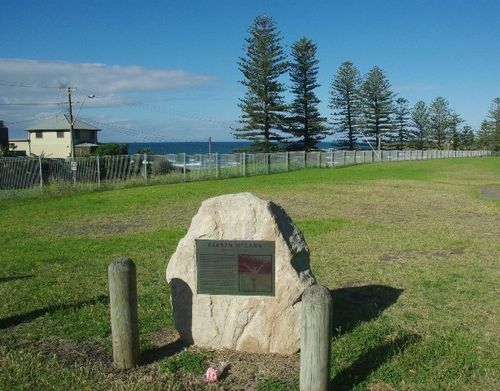 A monument commemorates Kerryn McCann (2 May 1967 – 7 December 2008) an Australia athlete, who is best known for winning the marathon at the 2002 and 2006 Commonwealth Games. She won her first Australian championship events in 1988, placing first in the one mile race, and first in the marathon, having previously come third in the marathon in 1986, and also won Australian championships in cross country (1992 and 1999), 10,000 metres (in 2002) and again in the marathon in 1993. At the 1994 Commonwealth Games in Victoria, Canada, she was placed tenth in the marathon, and at the 1996 Summer Olympics in Atlanta, United States she finished 28th. At the 2000 Summer Olympics in Sydney, Australia, she finished eleventh in the marathon. Her best result in international competition came later at the 2002 Commonwealth Games in Mancherster, United Kingdom where she won gold ahead of fellow Australians, Krishna Stanton and Jackie Gallagher. At the 2006 Commonwealth Games in Melbourne at the age of thirty-eight, she defended her Commonwealth title, winning gold in the marathon in a time of 2 hours, 30 minutes and 54 seconds. Kerryn McCann contracted cancer and died at her home on 8 December 2008. Kerryn Hindmarsh was born on the 2nd of May in 1967 to John & Judy Hindmarsh at Bulli. Kerryn was one of three children with siblings Jennifer & Darren. Kerryn was educated at Bulli High School & married local junior Australia surfing champion Greg McCann in 1991. Greg and Kerryn set up their family home within the Coledale community, raising three children, Benton 1997, Josie 2003 & Cooper 2008. Kerryn commenced running as a 10 year old and her talent, determination, discipline to training and mental toughness saw Kerryn emerge as one of Australia's finest distance athletes, leading to an outstanding athletics career repesenting (sic) Australia at the Summer Olympic Games in Atlanta 1996, Sydney 2000 and Athens in 2004. Kerryn represented Australia at 3 Commonwealth Games. In 1994 in Victoria, Canada, Kerryn finished 10th in the marathon, while in 2002 at the Manchester Games, Kerryn excelled, winning her first gold in the marathon. Kerryn defended her title at the Melbourne Games in 2006, winning gold in a sprint finish, two seconds ahead of her Kenyan competitor. This moment became a highlight of the Games and inspired millions of Australians. The win and ensuing celebration exhibited Kerryn`s courage, persistence, strong family focus and her always evident virtue of humility. In preparing for these events Kerryn could be found running along the local beaches, roads and cycle ways, always juggling challenging training sessions with her responsibilities in raising a young family. Kerryn was always a modest yet popular participant in many local and national running and community events and used her athletic prowess to raise awareness on a number of fundraising activities. Kerryn was diagnosed with breast cancer in August 2007 and her depth of character and courage inspired many in her loal community in the hardest race of her life until passing away on 7 December 2008. This plaque is located at St James Park Coledale to inspire young athletes and commemorate the memory of an ordinary Coledale resident and her extraordinary achievements.